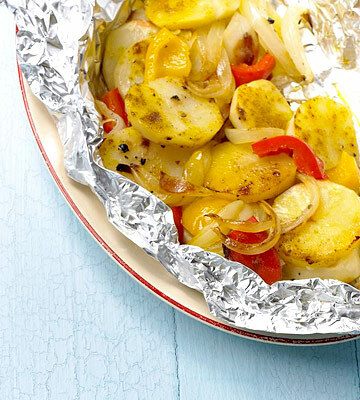 Sweet peppers, onion, and potatoes are seasoned, wrapped in foil, and grilled in this easy side-dish recipe. Make this for a cookout and you won't have to heat up the kitchen. Tear off four 24x18-inch pieces of heavy foil. Fold each piece in half to make a double thickness of foil that measures 18x12 inches; set aside. Divide vegetables and parsley among foil pieces, placing in center; drizzle with olive oil and sprinkle with seasoning blend, salt and pepper. For each packet, bring together 2 opposite edges of foil; seal with a double fold. Fold remaining edges together to enclose the vegetable mixture, leaving space for steam to build. For a charcoal grill, place packets on the rack of an uncovered grill directly over medium coals. Grill for 40 to 45 minutes, turning once halfway through grilling, until potatoes are tender. Remove packet from the grill and cool slightly before carefully opening the packets (hot steam will escape). (For a gas grill, preheat grill. Reduce heat to medium. Place potato packets on grill rack. Cover and grill as above.) Makes 4 servings.